Actes du Premier Congrès International d'Histoire des Religions (Part 1: Séances générales. Part 2: Séances des sections. 3 fasc.). 2 vols. Part 1: xxi, 246pp. Part 2: fasc.1, 143pp., fasc.2, 177, fasc.3, 163pp. Paris: Ernest Leroux, Part 1: 1901, Part 2: 1902. (Préface dated1903). Verhandlungen des II. Internationalen Kongresses für Allgemeine Religionsgeschichte. viii, 382pp. Edited by Organizing Committee of Congress. Basel: von Helbig und Lichtenhahn 1905. Transactions of the Third International Congress for the History of Religions. 2 vols. Part 1: 327pp. Part 2: 457pp. Edited by P. S. Allen and J. de Johnson. Actes du IVe Congrès International d'Histoire des Religions. 172 pp. Edited by Congress Organizing Committee. Actes du Congrès International d'Histoire des Religions. Liste des Membres du Congrès - Programme des Travaux. 2 vols., plus "Liste des Membres du Congrès - Programme des Travaux". Vol. I: 519pp., II: 466pp., "Liste des Membres du Congrès - Programme des Travaux": 32pp. Paris: Librarie Ancienne Honoré Champion 1925. It remained unclear whether this congress belonged formally to the series of IAHR Congresses, and the numeration was resumed with the Congress at Lund which followed it. Actes du Ve Congrès International d'Histoire des Religions. 346 pp. Lund: C. W. K. Gleerup 1930. Mélanges Franz Cumont. 2 vols., 1047 pp. Edited by Comité Directeur et Collaborateurs de l'Institut de Philologie et d'Histoire. This volume was not explicitly published as proceedings but contains, in effect, the proceedings of the sixth IAHR Congress, held in Brussels. 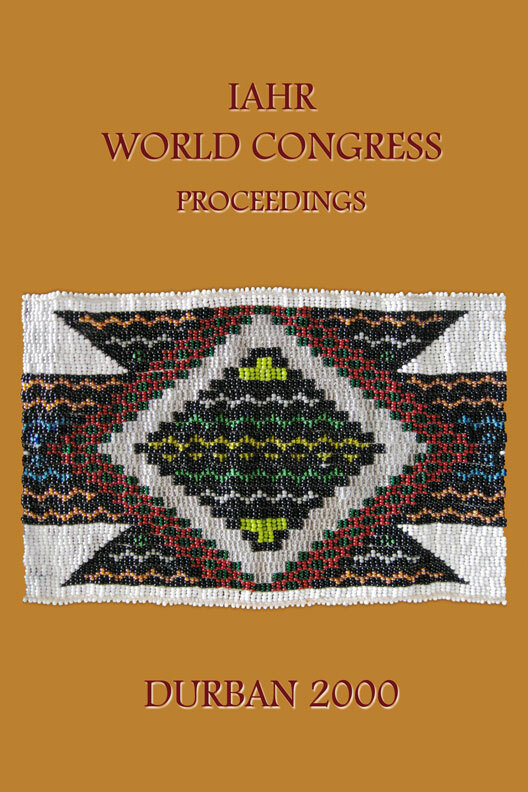 Proceedings of the 7th Congress for the History of Religions. 193 pp. Edited by C. J. Bleeker, G. W. J. Drewes and K. A. H. Hidding. Amsterdam: North-Holland Publishing Company 1951. Atti dell'VIII Congresso Internazionale di Storia delle Religioni. vii, 499pp. Firenze: G. C. Sansoni 1956. Proceedings of the IXth International Congress for the History of Religions, Tokyo and Kyoto, 1958. xiv, 914pp. Edited by Congress Organising Committee. This Congress was assigned a number in the sequence of major Congresses of the IAHR, although it did not fall into the five-year rhythm otherwise maintained from 1950 onwards. X. Internationaler Kongress für Religionsgeschichte, Marburg 1960. 241 pp. Marburg: N. G. Elwert Verlag 1961. Proceedings of the XIth International Congress of the International Association for the History of Religions, Claremont, CA. I The Impact of Modern Culture on Traditional Religions. II Guilt or Pollution and Rites of Purification. III The Role of Historical Scholarship in Changing the Relations among Religions. 3 vols. I: 181pp., II: 211pp., III: 89pp. Edited by C. J. Bleeker.Leiden: Brill 1968. Proceedings of the XIIth International Congress of the International Association for the History of Religions, Stockholm 1970. vii, 350pp. Edited by C. J. Bleeker, Geo Widengren and Eric J. Sharpe. History of Religions: Proceedings of the Thirteenth International Congress of the International Association for the History of Religions, 1975. 188pp. Edited by Peter McKenzie and Michael Pye. Leicester: Department of Religion, University of Leicester 1979. Traditions in Contact and Change. Selected Proceedings of the XIVth Congress of the International Association for the History of Religions. ix, 755pp. Edited by Peter Slater and Donald Wiebe. Waterloo: Wilfrid Laurier University Press 1983. Identity Issues and World Religions: Proceedings of the XVth Congress of the International Association for the History of Religions, 1985. 293pp. Edited by Victor C. Hayes. The Notion of "Religion" in Comparative Research: Selected Proceedings of the XVIth Congress of the International Association for the History of Religions, Rome, 3rd-8th September, 1990. 921pp. Edited by Ugo Bianchi in cooperation with Fabio Mora and Lorenzo Bianchi. Rome: "L'Erma" di Bretschneider 1994. Religion and Gender. xi, 324pp. Oxford & Cambridge: Basil Blackwell Ltd. 1995. These are revised papers read at a panel during the congress. Religion and Society: Proceedings of the 17th Quinquennial Congress of the International Association for the History of Religions (IAHR), Mexico City, 5-12 August 1995, organised by the Sociedad Mexicana para el Estudio de las Religiónes (SMER) and the Asociación Latinoamericana para el Estudio de las Religiones (ALER), at the Claustro de Sor Juana. 159pp. Edited by Yólotl González Torres and Michael Pye. Cambridge: Roots and Branches 2003. Besides the official proceedings of IAHR congresses, the Executive Committee established a process of inviting organizers of symposia, panels and other events at an IAHR congress to propose, subject to approval, the publication of "Adjunct Proceedings". Perspectives on Method and Theory in the Study of Religion: Adjunct Proceedings of the XVIIth Congress of the International Association for the History of Religions, Mexico City, 1995. vi, 347pp. Edited by Armin W. Geertz and Russell T. McCutcheon. Leiden: Brill 2000. Reprinted from: Method & Theory in the Study of Religion. Journal of the North American Association for the Study of Religion 12 (1/2), 2000. Gender / Bodies / Religions: Adjunct Proceedings of the XVIIth Congress of the International Association for the History of Religions. 363pp.Edited by Sylvia Marcos.Cuernavaca: ALER Publications 2000. Sectas o iglesias viejos o nuevos movimientos religiosos. 557pp. Compiled by Elio Masferrer Kan.
San Rafael: Asociación Latinoamericana para el estudio de las Religiones (ALER) and Editorial Plaza y Valdés 1998. Symposium on Religion and Gender. pp. 307-411. Special issue of Religion. An International Journal 28, 1998. Edited by Sylvia Marcos and Rosalind I. J. Hackett. Western Esotericism and the Science of Religion: Selected Papers presented at the 17th Congress of the International Association for the History of Religions, Mexico City 1995. (Gnostica: Texts and Interpretations). xvii, 309pp. Edited by Antoine Faivre and Wouter J. Ganegraaff. Edited by Rosalind I. J. Hackett and Michael Pye. Cambridge: Roots and Branches, 2010). Theoretical Frameworks for the Study of Graeco-Roman Religion: Adjunct Proceedings of the XVIIIth Congress of the International Association for the History of Religions, Durban, South Africa, 2000. 281pp. Edited by Luther H. Martin & Panayotis Pachis. Thessaloniki: University Studio Press 2003. The Interface between Research and Dialogue: Christian-Muslim Relations in Africa. Adjunct Proceedings of the XVIIIth Congress of the International Association for the History of Religions (5-11 August 2000, Durban/South Africa). vii, 176pp. "A Twice-Told Tale: the History of the History of Religions' History," Numen. International Review for the History of Religions XLVIII (2), 2001, pp. 131-146. A plenary address transmitted to the congress from Chicago by video broadcast. "Universals, General Terms and the Comparative Study of Religion," pp. 238-266, by Jeppe Sinding Jensen. "Comparison: Some Suggestions for Improving the Inevitable," pp. 267-275, by Benson Saler. "Universals Revisited: Human Behaviors and Cultural Variations," pp. 276-289, by William E. Paden. "Comparativism and Sociobiological Theory," pp. 290-308, by Luther H. Martin. "Comparative Religion, Taxonomies and 19th Century Philosophies of Science: Chantepie de la Saussaye and Tiele," pp. 309-338, by Thomas Ryba. "In Defense of the Comparative Method," pp. 339-373, by Robert A. Segal. IAHR World Congress Proceedings,Tokyo 2005. Religion and Society: An Agenda for the 21st Century. Cambridge: Roots and Branches, 2010. Gerrie ter Haar and Yoshio Tsuruoka (eds. ), Religion and Society: An Agenda for the 21st Century. Leiden and Boston: Brill, 2007. Published in the series International Studies in Religion and Society (ISRS), volume 5. ISSN: 1573-4293. 306 pp. In Japanese a similar volume of key contributions has been edited by Susumu Shimazona, Gerrie ter Haar, and Yoshio Tsuruoka: Shukyo: Sokoku to Heiwa (Religon:Conflict and Peace) published by Akiyama‐Shoten, Tokyo 2008. The Practice of Altruism: Caring and Religion in Global Perspective. Edited by Ruben Habito & Keishin Inaba, Cambridge Scholars Press, 2006. the publication resulted from a session chaired by the two editors. Not all chapters included are based on papers presented at the Congress. Peace Education and Religious Plurality: International Perspectives. Edited by Robert Jackson & Satoko Fujiwara eds.Routledge, 2008. The publication resulted from a session chaired by the two editors. Not all chapters included are based on papers presented at the Congress. Religion, Science and Sustainability, Edited by Takeshi Kimura, Union Press, 2008. The publication resulted from a session at the Congress. Not all chapters included are based on papers presented at the Congress. Japanese Journal of Religious Studies, volume 32, no.2 (2005) was devoted to articles emanating from the Congress. Shukyo kenkyu (Journal of Religious Studies) vol.79‐2, no.245, Sept. 2005 published a collection of papers and responses (in Japanese) under the heading 'reports on the 19th World Congress of the IAHR in Tokyo’ (pp.1‐144). Temenos, Nordic Journal of Comparative Religion, vol 41, no 2, 2005(Knott, Anttonen, Kunin, Kong) published a number of papers from the panel on ‘Religion, the sacred, and spaces of contetation, segregation and difference’. Details can be found at http://www.hum.utu.fi/uskontotiede/temenos412.pdf. 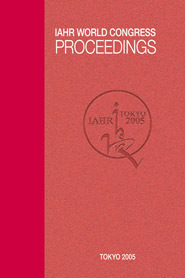 The Council of Societies for the Study of Religion Bulletin, 34, November 2005 published a collection (guest edited by Jack Llewellyn) of papers presented in Tokyo. Religion 39/4 2009, a special issue guest edited by Bryan Rennie who organized two sessions on ‘The Philosophy of Science and the Study of Religion’ published six papers from that session and an introduction tand two responses . A seventh revised paper also presented in that session was published separately in Religion 40/1, 2010, 1-13. University, Seoul, February 2005), 7-33. Teruo Utsunomia, “Life, Death, and Technology: The Role of Religion in the Acceptance of New Biomedical Technologies,” The Annual Report on Cultural Science, The Graduate School of Letters, Hokkaido University, No. 118, 2006, pp.1-12. Charles Ess (with Akira Kawabata and Hiroyuki Kurosaki), “Cross-Cultural Perspectives on Religion and Computer-Mediated Communication,” Journal of Computer-Mediated Communication, 12(3), 2007 (April), pp.939-955, 977-1042. IAHR World Congress Proceedings, Toronto 2010. Religion: A Human Phenomenon. Initiation. Contributions to the Theme of the Study Conference of the International Association for the History of Religions, Strasbourg, Sept. 17th-22nd 1964. viii, 309pp. Edited by C. J. Bleeker. Leiden: Brill 1965. Le Origini dello Gnosticismo: Colloquio di Messina 13-18 Aprile 1966. Testi e Discussioni. xxxii, 803pp. Edited by Ugo Bianchi.Leiden: Brill 1967, 19702. Types of Redemption: Contributions to the Theme of the Study Conference held at Jerusalem 14th-19th July 1968. 261pp. Edited by R. J. Zwi Werblowsky and C. J. Bleeker. Leiden: Brill 1970. Science of Religion: Studies in Methodology. Proceedings of the Study Conference of the International Association for the History of Religions held in Turku, Finland, August 27-31, 1973. 629pp. Current Progress in the Methodology of the Science of Religions. 308pp. Warsaw: Polish Society for the Science of Religions 1984. Marburg Revisited: Institutions and Strategies in the Study of Religion. 164pp. Studies on Religions in the Context of Social Sciences: Methodological and Theoretical Relations. 226pp. Warsaw: Polish Society for the Science of Religions 1990. Religionswissenschaft und Kulturkritik: Beiträge zur Konferenz The History of Religions and the Critique of Culture in the Days of Gerardus van der Leeuw (1890-1950). 399pp. Edited by Hans G. Kippenberg and Brigitte Luchesi. Though not stated explicitly in the publication, the conference took place with the official status of a Regional Conference of the IAHR. Northern Religions and Shamanism. The Regional Conference of the International Association of the History of Religions, Selected Papers. 214pp. Edited by Mihály Hoppál and Juha Pentikäinen. Budapest: Akadémiai Kiadó and Helsinki: Finnish Literature Society 1992. Religious Transformations and Socio-Political Change: Eastern Europe and Latin America. 457pp. Edited by Luther H. Martin. Berlin & New York: Mouton de Gruyter 1993. The Study of Religions in Africa: Past, Present and Prospects. Proceedings of the Regional Conference of the International Association for the History of Religions, Harare, Zimbabwe 1992. 393pp. Edited by Jan Platvoet, James Cox and Jacob Olupona. Cambride: Roots and Branches 1996. Religion and Modernization in China: Proceedings of the Regional Conference of the International Association for the History of Religions, Beijing, China, April 1992. 346pp. Edited by Dai Kangsheng, Zhang Xinying and Michael Pye. Cambridge: Roots and Branches 1995. The contents of this volume also appeared in Chinese in the journal Shijie Zongjiao Ziliao (92/4 and 93/1). An IAHR Special Conference. No proceedings published. Religions in Contact: Selected Proceedings of the Special IAHR Conference Held in Brno, August 23-26, 1994. 228pp. Edited by Iva Doleñalová, Bretislav Horyna and Dalibor Papoušek. Brno: Czech Society for the Study of Religions & Institute for the Study of Religions of the Faculty of Arts of the Masaryk University 1996. Rationality and the Study of Religion. 221pp. Edited by Jeppe Sinding Jensen and Luther H. Martin. Aarhus: Aarhus University Press 1997. Although this is not stated explicitly in the publication, the conference took place with the official status of a Special Conference of the IAHR, while being at the same time a workshop for doctoral students from the Nordic countries. Religion y Etnicidad en America Latina: Memorias del VI Congreso Latinoamericano de Religion y Etnicidad ALER y II Encuentro de la diversidad del hecho religioso en Colombia ICER. 3 vols., I: vii, 391pp., II: vii, 447pp., III: vii, 449pp. Although this is not stated explicitly in the publication, the conference took place with the official status of a Regional Conference of the IAHR. An IAHR Co-Sponsored colloquium. No proceedings published. Approaching Religion. Part I. Based on Papers Read at the Symposium on Methodology in the Study of Religions Held at Åbo, Finland, on the 4th-7th August 1997. 310pp. Åbo: The Donner Institute for Research in Religious and Cultural History & Stockholm: Almqvist & Wiksell International 1999. Ugo Bianchi: Una vita per la storia delle religioni. (Biblioteca di storia delle religioni, 3). 525pp. The proceedings of an IAHR Co-Sponsored Memorial Conference for Ugo Bianchi. An IAHR Regional Conference. No proceedings published. A joint IAHR and NAASR Round Table at the Twentieth World Congress of Philosophy. The papers have been published or are currently in press in several different journals. The Academic Study of Religion during the Cold War East and West. (Toronto Studies in Religion, 27). xviii, 336pp. Edited by Iva Doleñalová, Luther H. Martin, and Dalibor Papoušek. New York: Peter Lang 2001. An IAHR Special Conference. No proceedings have been published. What Is Religion For? x, 346pp. Wellington: New Zealand Association for the Study of Religions/Religious Studies Programme, The School of Art History, Classics, and Religious Studies, Victoria University 2004. Vanias Publications, Thessaloniki 2004 (Acts of the Panel held during the 3rd Congress of the EASR, Bergen, Norway, 8-10 May 2003). An IAHR Special Conference. Some other individual papers will be published in various journals. An IAHR Regional Conference. Proceedings are underway. An IAHR Special Conference. A selection of the papers has been published as vol. 2 of the Review Banduein 2008. Religious Harmony: Problems, Practice and Education, XXVI + 324p. Archaeus, vol. 11 & 12, 2007-2008, Proceedings of the 6th EASR / IAHR Special Conference "Religious History of Europe and Asia", Bucharest 20-23 September, 2006, vol. 1, general editor: Eugen Ciurtin. Archaeus, vol. 13, 2009, Proceedings of the 6th EASR / IAHR Special Conference "Religious History of Europe and Asia", Bucharest 20-23 September, 2006, vol. 2, general editor: Eugen Ciurtin. Archaeus, vol. 14, 2010, Proceedings of the 6th EASR / IAHR Special Conference "Religious History of Europe and Asia", Bucharest 20-23 September, 2006, vol. 3, general editor: Eugen Ciurtin. An IAHR Special Conference. Proceedings are underway. Antes, Peter: The study of religions on demand, in Religio. Revue pro religionitisku XVII/2009/2, 111-124. Wiebe, Donald: Religious biases in funding religious studies research? <http://digilib.phil.muni.cz/handle/11222.digilib/125290> in Religio. Revue pro religionitisku XVII/2009/2, 125-140. Baumann, Martin: Temples, cupolas, minarets : public space as contested terrain in contemporary Switzerland <http://digilib.phil.muni.cz/handle/11222.digilib/125291>, in Religio. Revue pro religionitisku XVII/2009/2, 141-154. <http://digilib.phil.muni.cz/handle/11222.digilib/125295>, in Religio. Revue pro religionitisku XVII/2009/2, 209-230. As far as is known the following proceedings are currently in print. Regional and Special conferences: Turku 1973, Marburg 1988, Groningen 1989, Helsinki 1990, Burlington 1991, Beijing 1992, Harare 1992, Brno 1994, Aarhus 1996, Bogotá 1996, Turku 1997, Salerno 1997, Brno 1999. In case of difficulty apply to one of the officers (sp. publications officer) of the IAHR.